Mars and Venus 1 - john-shanahan-berlins Webseite! The golden section and planetary distances. 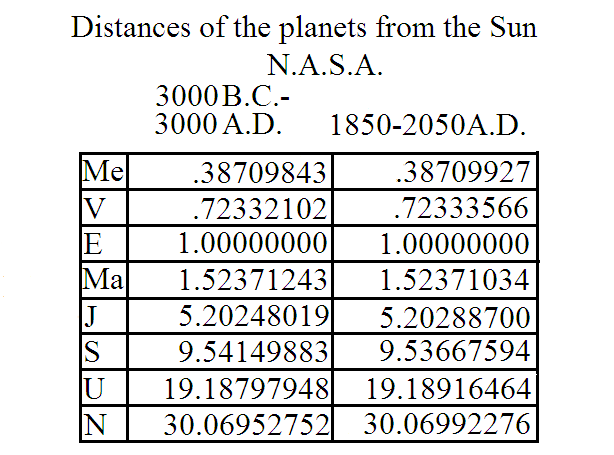 Are the distances of the planets from the Sun arbitrary? could there be hidden geometry in the structure of the solar system, the golden section for example? I am not the first to speculate on this but I might be the first to have discoverd two intriguing facts about the Astronomical Unit values of Venus and Mars. The first is, that successive Fibonacci powers of the A.U. values behave thus and result in Phi or golden section powers. Phi= 1.618033989.
it was of course, the great German astronomer and mathematition Johannes Kepler who used a music interval, the natural fifth of 1.5. as a power, in his third law of planetary motion.It was also he that in his five platonic solids model of the solar system placed the icosahedron between Venus and the Earth and the dodecahedron between the Earth and Mars. It was beutiful but completely wrong, although the golden section is inherently part of the structure of both the dodecahedron and the icosahedron. Inspired by Kepler I have come up with the following model of four planets. Here, using the process of iteration are the A.U. values that fit all the equations above.Higher or lower sequences of the fibonacci powers also work approximately as does the Lucas sequence. NASA defines the Astronomical Unit values of the solar system for two different time periods. Unless otherwise stated it is the 3000 years B.C. 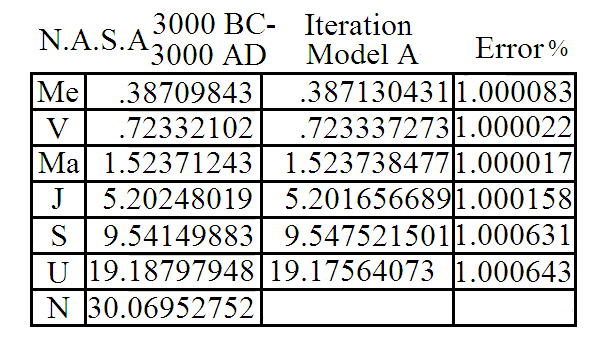 to 3000 yers A.D. values that I will be using in my search for Phi or the golden section. It was quite by accident that I came across the following equation. Oh! thats nice I thought, three Fibonacci numbers in a row. It was only years later that I realised that a fibonocci sequence higher or lower than that above would also work approximately, this one is even better. and the Lucas sequence works as well. The discrepancy in the equations can best be corrected in the following manner, By adding the Fibonacci powers together, as in the second equation, 55+21=76 and finding the 76th root of the discrepancy 1.00000117%, then it is this factor that Mars and Venus must be altered by, in this case devided by, to get the correct result, Mars 1.523710684 and Venus .723320173. Of course this discrepancy could be loaded to just one planet or spread between them in many differnt ways. The obvious question at this point, of course, is does this work with any other of the twenty possible planetary pairs (between Mercury and Neptune) and the short answer is no! Execpt with Mercury and Jupiter, whereby although it is a multiplication between an outer planet and a inner planet (as seen from the Earth) it is not exactly the same as the Mars Venus relationship. This was most disappointing, only two such connections out of a possible twenty one pairs! and why when it works does it work so well? Just as disapointing was the fact that I could not find a relationship between Jupiter and Mars or Venus, or Mercury and Mars or Venus. I could of course have devided or multiplied both pairs with one another but eventually i gave up and in taking some inspiration from Kepler I got lucky. Now to cut a long story short, by use of iteration, that is to continually correct the values so that both equations would be correct, I arrived at the following.The inverse of the fifty second root of Phi power 35.
and there is a convoluted reason why this also works. So it is clear to see that by multiplying or deviding the music interval powers by other music intervals, in the case above by 2, the octave, then the results can change while sticking to the same values. Here is one more example just for fun. I have another 7 or 8 of these equations and there must be many more but my point is that by using the 52nd root of Phi power 35 (inverse) as an approximation for the A.U. value for Venus and the 585th root of Phi power 512 for that of Mars then I have found two sharp tools that may prove usefull in searching for Phi in the solar system. I am certainly not suggesting that these values are somehow magical, or that Venus and Mars ever had, or ever will have such values, and I will abandon these artificial values in favour of iterated values as soon as I have built a model. Astronomic Unit values are not constants and over millions of years as the Sun looses mass and the planets gain a little, they all drift further away from the Sun.I initially feared that this fact would automatically undermine any patterns I may come up with but then this would only affect the absolute distances and not necessarily the proportional relationships between the planets. On the other hand I can not assume that proportions would be maintained in such a manner that would suit patterns that I have come up with.It is perhaps worth mensioning at this point that my manipulated Venus and Mars values can also be expressed as the 13th root of Phi power 7 to the power 1.25 (recprical) for Venus and the 13th root 0f Phi power 8 to the power 1.42222 for Mars. The interval 1.25 is the 3rd most important music interval of all, after 2 the octave and 1,5 the natural 5th.The interval 1.42222 is the product of 1.3333 times 1.06666, the natural 4th times the diatonic half tone. 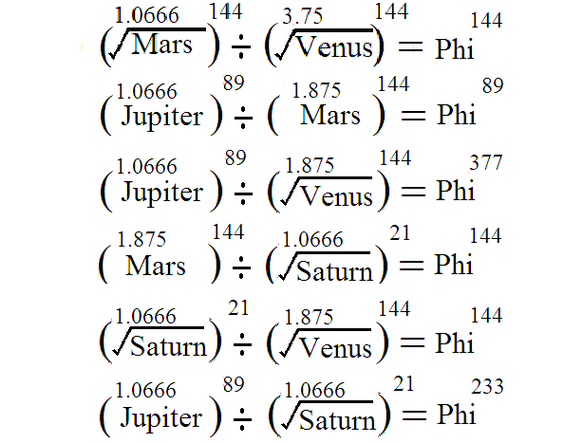 Luckily they are not contradictory and by way of iteration, I have made a list of equations which are all good for the equation stated and also Mars power 1.875 devided by the 1.875 root of Venus equaling Phi squared. The most obvious music interval to go along with 1.875 would be its counterpart, that is what is left over from the octave two, i.e. 2/1.875= 1.0666666, and again I got lucky. It must be rememberd that will it will be the 144th root of the discrpancy that will correct the first equation 1.000022687% and since the answer was too high Jupiter must be devided by this factor and Mars mulipied by it. Jupiter = 5.202369543 = 1.000021269% and Mars = 1,523730866 = 1.000012099%, At this point I am going to introduce my manipulated values of Venus and Mars because they are in a sort of lock step relationship with one another. My manipulated values for Venus and Mars can also be expressed in the following manner. 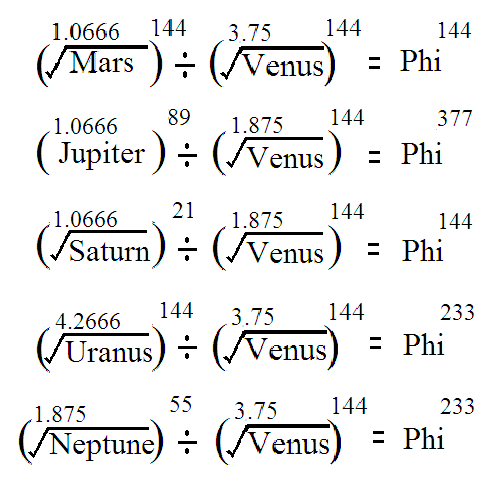 The 39th root of Phi power 14 (inverse) will get me the 1.875 root of Venus =.841354062 and the 39th root of Phi power 64 will get me Mars power 1.875. = 2.202693506. By using these values as constants I can calculate a value for Jupiter dependant on which Fibonacci power sequence I am using. The value for Jupiter in the Jupiter power 89 equation above is then 5.201602391 which is 1,000168755% away from the NASA value. 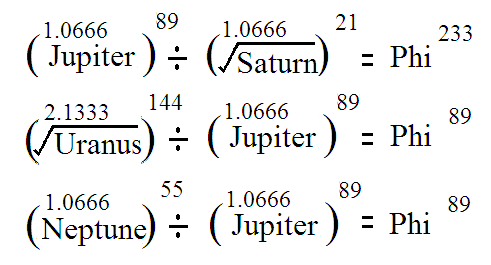 Take the sequence down a step for Jupiter power 55 and the value for Jupiter will be 5,202389147 = 1.0000175%. Using the Lucas number of power 76 for Jupiter and its value is 5.203310632 = 1.000159624%. Now it is hardly suprising that those equations work fairly well since I have manipulated Mars and Venus to make them work but what about Saturn? I got lucky again in that the i.0666666 root of the Saturn A.U. value fits in well enough. So here is a list of six planetary pairs that I will call Model A. Here I will abandon my manipulated Mars and Venus values and by using iteration, the values below will fit all of the equations above. As a next step i will try iteration at the lower step of Jupiter power 55 etc. This model would then be called Model A -1. But this time my luck has run out because the lock step relationship between Mars and Venus counts against me. 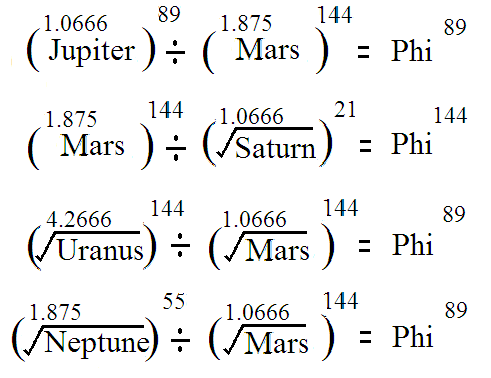 By substituting Mars power 1.875 for the 1.875 root of Venus, as in the Jupiter and Saturn equations, this time with Uranus and Mars, I arrive at Phi power 432! 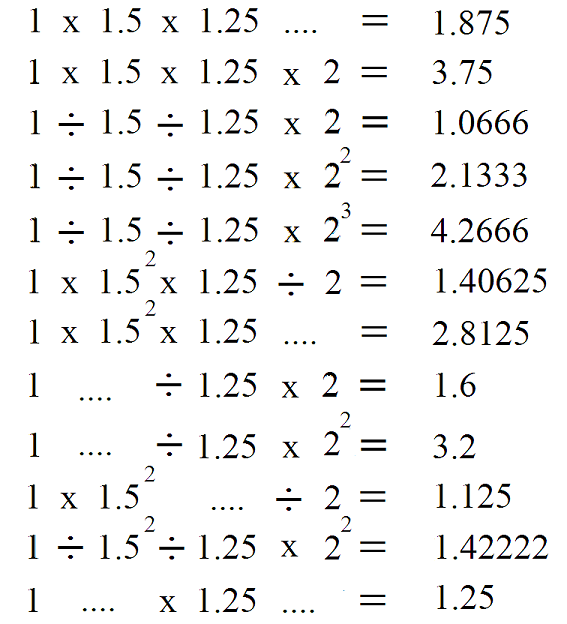 This can be solved by finding the 3rd root of the equation because 432/3 = 144. Now the best part of the patterns I have are not so much in the Phi powers but in the music interval powers which are perfect for Venus through to Saturn and here is a multiplication instead of a division. 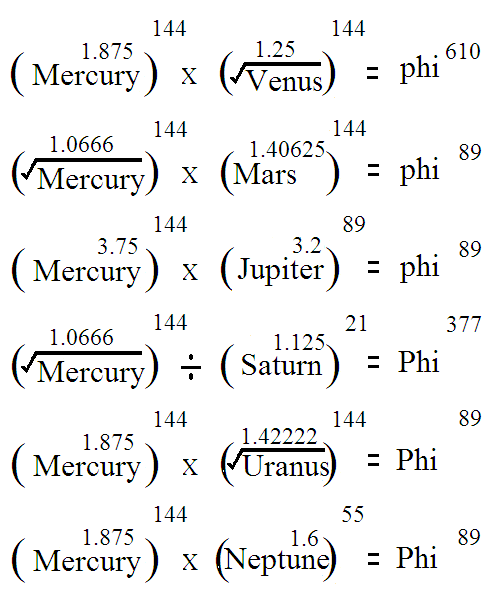 Worse still substituting Mars instead of Venus in The Neptune equation results in Phi power 1309! and so I fear this is a dead end if I want a pattern along the lines of those for Jupiter and Saturn. There is though, another approach, in that although Jupiter and Saturn work well with a Phi squared from Mars and Venus perhaps Phi itself may work with Uranus and Neptune. 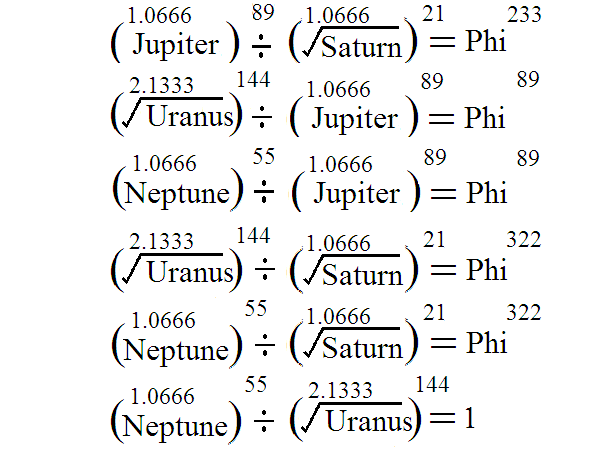 As for Uranus the 1.0666666 root of it works, sort of but 2 octaves down and so it is the 4.2666666 root of Uranus that fits with Mars and Venus thus. The number 322 is not a Fibonacci but a Lucas number, which is sort of inevitable. The table below shows the A.U. 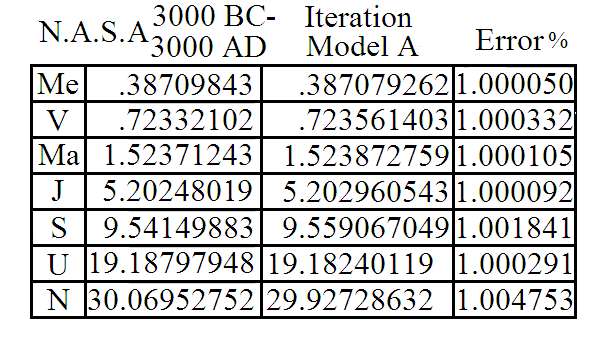 values by iteraration that fit the equations above. The rather weak value for Neptune drags the others down somewhat, Using Model A+3 just for Jupiter Saturn and Uranus comes out a lot better. 1364 is a Lucas number! Given that Mars Venus and Phi worked with Uranus and Neptune and that Mars Venus and Phi squared worked with Jupiter and Saturn could Phi cubed work with Mercury? 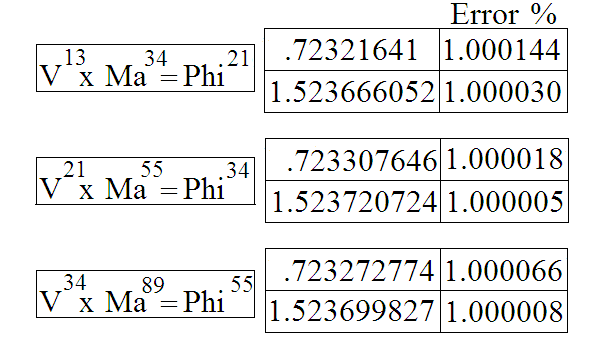 these equations result in inverse Phi values or phi. Mercury fits in well with the overall pattern with its 1.06666 root and that squared is power 1.875 and squared again is 3.75 but all the other planets have ended up with a dogs dinner of music intervals. Most pocket calculaters will need the fibonacci powers to be devided by 10 to stay within the range. Note the Phi values with the small p, phi are x to the minus one values. Venus looks alright with either the 1.875 root, or 3,75 the square root of 1.875 but the 4,26666 root for Uranus seems to spoil the picture althoght 4.26666 divided by two octaves is 1.06666. It starts like this 1 1 2 3 5 8 13 21 34 55 89 144 233 377 610 987 and goes on forever but two succesive numbers added together determine the next one. 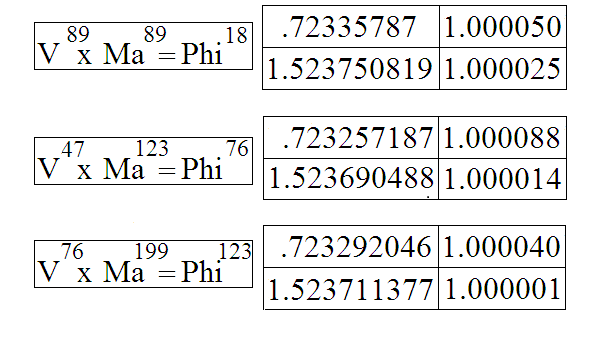 and so It is clear to see that the higher the pair of Fibonacci numbers the closer the answer is to Phi. 987/610 = 1.618032787 = 1.000000743%. The Lucas sequence is the same in prinicple it just starts a bit later 1 3 7 11 18 29 47 76 123 199 322 521 843 843/521 = 1.618042225 = 1.000005091%. Keplers third law of planetary motion is still valid today. The square of the orbital period of a planet is proportional to the cube of the semi major axis of its orbit. When I first heard this it went in one ear and out the other but it realy is easy to understand from the following. The average distance of the Earth from the Sun is defined as the number one, that is then 1 Astronomical Unit and NASA defines the A.U. value for Venus as .72332102. This to the power 1.5 is .615172097 and this multipleid by the number of days in the Earth year 365.25 = 224.692 or 225 days approximately, The same is of course true for all the other planets and so by knowing the mean distance of a planet from the Sun (or any other object that circles the Sun) then by using the music inteval of 1.5, the natural fifth as a power then the orbital period of the object can be calculated. (and of course vice versa). Keplers third law is also called his harmonic law but this is strickly speaking not true, because music intervals work as factors not as powers! A guitar or fiddle string whose length is multiplied or divided by 1.5 would indeed be in tune but that string length to the power 1,5 would be musically meaningless. The only way that using music intervals as powers makes any sense is in the follwing example. Successive octaves or powers of two can be generated by using music intervals as powers in the followig manner. This is true for all numbers including Phi but note that 2 power 7 11 13 and 14 are not acheivable by using music intervals as powers. Music intervals wrong foot the best musicians and the best mathematitions. There is though, the simple and undisputed law of the octave that states by doubling the length of a string the frequency of the note will be halved and that by halving the length, the frequency will double. Our ears recognize these sounds as being the same note, much as our eyes recognize different shades of the same colour. All music intervals are the products of three numbers 2, 1.5, and 1.25, which is not the same as all products of the three numbers are music intervals.These three numbers can best best be seen, heard and understood by playing the so called harmonics on a guitar string, the 6h or lowest bass string works best. The octave is not the only indisputable music interval, by dividing the string by three, an harmonic 1.5, or the natural fifth is generated above the seventh fret and also on the other side of the string more or less above the sound hole, not used by guitar players because there is no fret to guide the fingers. (dividing the string by 6 should also work but I found this to be truly inaudible) There is also a series of harmonics, all exacctly the same when the string is divided by five. Starting from the left the first occurs above the 4th fret, the second above the 9th fret, the third above the 16th fret but there is no fret to guide the finger for the fourth one. If one looks very closely at the 4th fret it is clear to see that the harmonic occurs slightly before it and this illustrates the difference between 1.25 the natural 3rd and the modern chromatic 3rd which is sharp. The value for the chromatic 3rd is 1.25992105, divided by the natural 3rd of 1.25 results in a discrepancy of 1.00793684% which is extremely annoying for anyone with good ears. The gradual introduction of the chromatic division of the octave more or less coincides with the industrial revolution and it is as if someone had had enough of all the confusion surrounding music intervals and had issued a decree that from now on all music intervals would be equal and mathematically perfect. The new interval, the twelth root of two, would devide the octave into twelve perfectly proportional steps such that my 4th fret would be the 12th root of two to the power 4 and my 5th fret the power 5 etc. It seems to be Johann Sebastian Bach who we have to thank for this but when playing so many notes so fast this dichotomy is not so noticeable.When playing long slow notes it most definitely is. It could be worse of course, at least we get his well tempered piano and not his bad tempered piano and it sure beats carrying twelve guitars around everywhere since the guitar frets would be in slightly different positions for each of the twelve keys. All of this is not a matter of taste or of culural preference, or historical development it is a matter of physics and has been known of, if not entirely understood for thousands of years. Here is a breakdown of all the music intervals that I have been using up untill now. Here is a mathematical breakdown of the major scale in western music, also known as the do ray me sequence. For those mathematitions who get constantly confused by terms such as the natural fifth only to find that this is the seventh fret on the guitar here is why. It is the the fifth note in the do ray me scale! 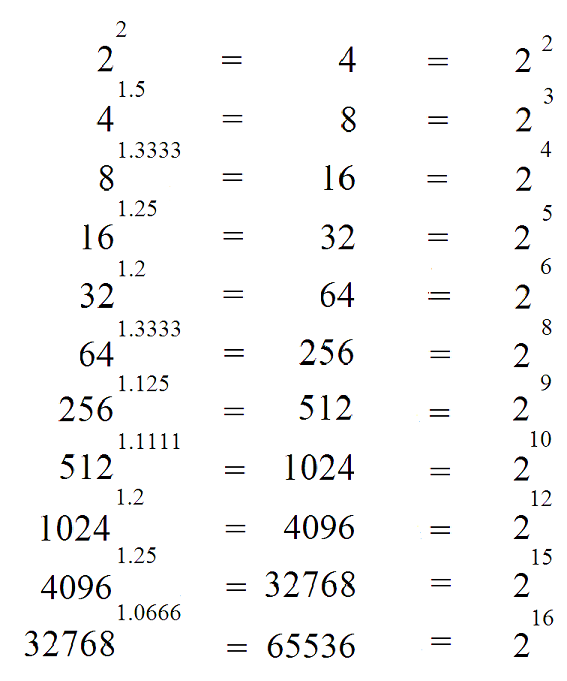 The second row of numbers fills in the gaps, that is to say the intervals between the intervals. To sum up then it is the string divided by 2,3 and 5 that is the basis for music harmony and all music intrevals are products of these three numbers (given that it is the division of the octave the numbers are 2, 3/2 and 5/4, or 2 , 1.5 and 1.25). It is somewhat of an accident that all the numbers between 1 and 10 are musical apart from 7 but 4 is 2 x 2, 6 is 2 x 3, 8 is 2 power 3 9 is 3 squared and 10 is 2 x 5.dividing the string by 7 11 and 13 etc makes some sort of noise but it is not harmonic or musical. Golden section and music intervals? There is no getting away from the fact that although Phi is geometrically beauiful it is not musicaly beautiful, The Fibonacci sequence starts so well with 1,5, 1.666666, 1,6, and the Lucas sequence gets us 4/3 1.333333 but it is 13/8 that spoils everthing. There is no mathematical definition of "out of tuneness" but if there were then this 13/8 would be near the top of the list. The continuation of the sequence 21/13, 34/21, etc, alternatively sharpens or flattens the interval somewhat but does not improve upon it. The closest I could get to Phi by using music intervals is in the following, 2 power 4 divided by 1.5 power 4, devided by 1.25 power 3 = 1.61817284 = 1.000085814%. Good as this result is it is just as dreadfully unmusical as 13/8. The best relationship to music intervals is in the square root of 1.25, = 1.118033989, whereby the number is exactly .5 short of Phi. This is also exactly equidistant between the the natural or diatonic intervals for the small and large whole tones of 1.11111111 and 1.125 = 1.00623059%. Another connection could be Phi power 24, which is very close to 2 power 14 times 1.5 power 4, times 1.25. The problem here is that i do not have a music keyboard that goes beyond 14 octaves and it is way beyond the human hearing range anyway!